Tackling challenges from the most power-intensive peripherals head on, solitary 12 V power rails provide ample power and strong resistance to any overloading. Speed control makes the 120 mm fan adept for any user’s circumstances and need. Over Voltage Protection (OVP), Over Power Protection (OPP), Over Current Protection (OCP), Short Circuit Protection (SCP). Producing hold times >14ms upon full loading. 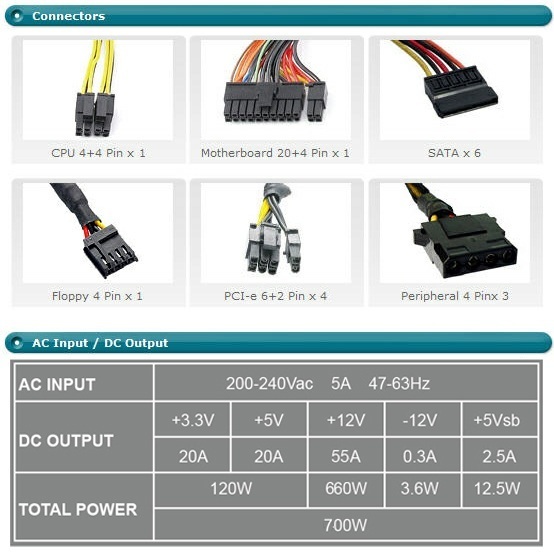 Connector MB 20+4 Pin x 1, CPU12V 4+4 Pin x 1, PCI-e 6+2 Pin x 4, SATA x 6 4Pin Peripheral x 3, 4Pin Floppy x 1.